It looks like I was going out on the town to catch up with some girlfriends or heading to a fashion show, right? Well, I wasn't. I put on this obnoxiously vibrant outfit yesterday to go grocery shopping. In my opinion, there's nothing wrong with dressing up and feeling pretty even while performing the most mundane tasks. I'm pretty sure the grocery store employee offered to help me pick out my frozen berries mainly because I was dressed up. Only because I was dressed up. Lately I've decided to start exercising in order to stay fit and start leading a healthier lifestyle (aka I need to balance out all the beer I'm drinking, if we're being honest around here). If you ask all my friends, I'm probably the last person they would expect to go to a gym. Instead, you would find me napping in my bed with my hand in a bag of chips. But things are going to change around here. Plus, my college roommates and I finally booked out trip to Miami in April so that's some extra motivation. Bathing suit season, amirite? I love those two colors together. Great combination, you look lovely! I love your poses. You look like a dancer. 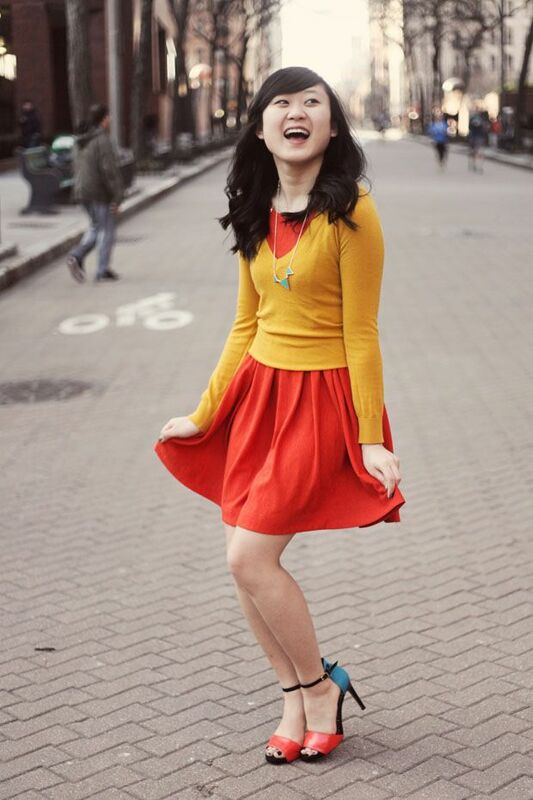 Your red dress c/o Lulu*s.com looks very pretty and is complemented very nicely by the mustard yellow colour of Forever 21 sweater. omg!!! you're a walking ray of sunshine!! not just with your outfit but with your smile!!!! Oh, Jen! I just adore how your outfit is so colorful and the backdrop is grey. You're an exciting splash of color against an otherwise mundane city, hehehe. ;) Except your city isn't mundane at all. But the colors are just a bit compared to the EXCITING JEN!! So yeah, you look amazing in every color. I love the redorange against the yellow like that. Tertiary colors, yeah! Work that color wheel logic. LOVE the color blocking going on here. I miiiight have to recreate this look. And I so understand the gym thing. I joined one few months back and attended only two sessions. Though in my case I need one. You needn't worry about weight issues. You look totally fab the way you are right now. have a great week. The colours in this outfit are so amazing. They come together so well. Good luck on your gym motivation! I'm not a huge fan of the gym so I work out at home to youtube videos. Now that I have a workout routine I am actually excited to work out sometimes. What? I know. I've been working out in preparation for a trip in April too, we're going on a cruise! :) You probably don't have to worry about swimsuit season though, you look amazing! 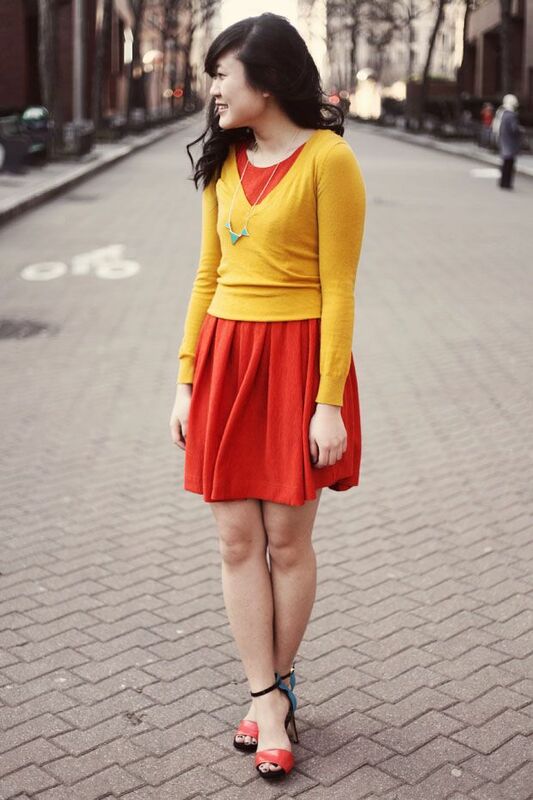 I love the mustard and orange combo and those shoes are seriously incredible! I want to steal them. Absolutely beautiful outfit! 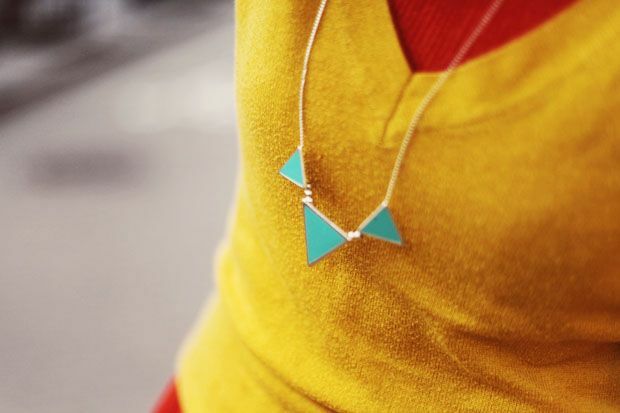 I really love all the bright, bold colors! But I love it :) And I love you! Going to the gym is so annoying - so time consuming, right? I have to start going over lunches - I'm half like 'yay I'll be all healthy' and I'm half like 'I love my lunch break......wahhh' Anyhow - I LOVE this colorful mix on you - how fun! It reminds me of citrus! What a darling outfit. I love the blasts of color. It looks so stunning on you. 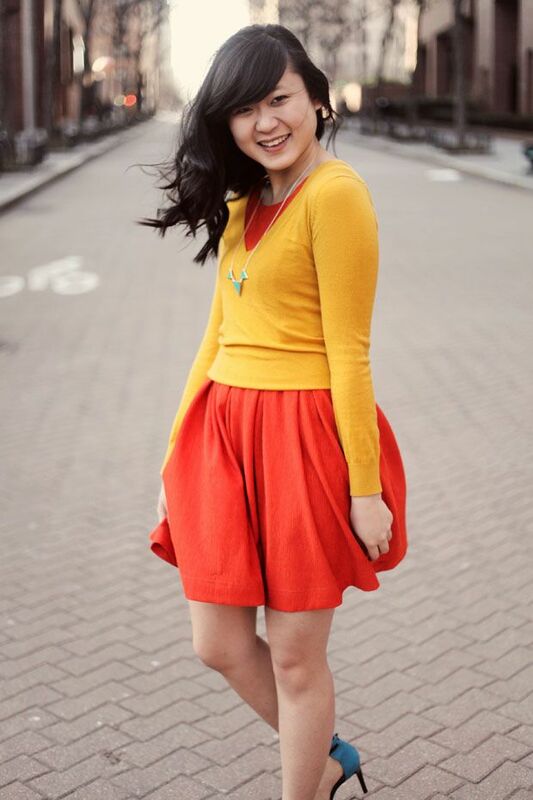 love this pairing of yellow and orange! i have been working out to some fitness dvds lately, they are more fun than the gym sometimes lol. The colors of this outfit are so perfect. The shoes totally make the look. I should probably start working out, but how does one find the time? !